Regardless of how familiar you are with Indian food, I’m sure you’ve never heard of beef borma before. That’s because I coined the term “borma” for a happy accident where I mistakenly made a dish that was half bhuna and half korma. My housemate and my friend and I liked this dish so much that I decided it was worthy of 1. sharing and 2. distinguishment from other Indian curries. Note that authentic bhuna and korma dishes involve slow cooking beef for at least 1 1/2 hours. But I don’t like the texture of slow cooked meat, so I prefer to use tender cuts of meat and make fast-cooked versions of Indian curries. The great thing about this cooking method is that you can enjoy an authentic tasting Indian curry on a work night without compromising on the restaurant-like flavour. See here for tips on how to get the most flavour out of your Indian spices. Photo above: I was making homemade Indian take out for my friend’s birthday. 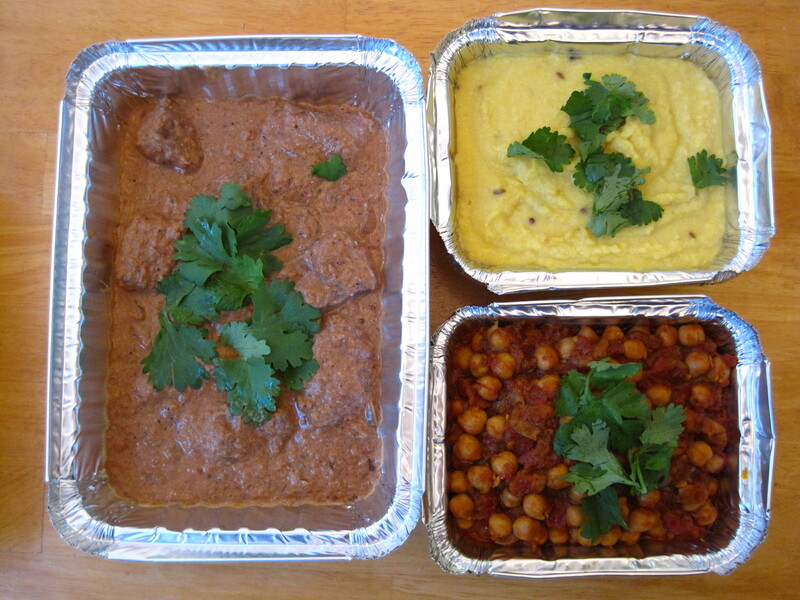 Pictured are beef “borma”, tarka dall (lentils) and chana masala (chickpeas). Use a blender to grind the coriander, cumin, cardamom, and whole cloves. Then add the garlic and ginger and grind again. Finally, add the almonds, cinnamon, chili (flakes or powder), a large pinch of salt, and 1/3 cup of water. Grind until you have a paste. Set the blender and its contents aside. Pour the flour into a shallow bowl and coat each piece of meat lightly, shaking off the excess flour. Place a medium sized, heavy bottomed pot (I use a ceramic dutch oven) over medium high heat. Add enough oil to lightly coat the bottom of the pot. When the oil is hot, brown all sides of the meat, dish it out and set aside. Do not cook the meat all the way through. You will need to do this in batches. Add more oil as needed between batches. When all of the meat has been browned, reduce the heat to medium and cook the diced onions until brown, about 5 minutes. Then add the paste from the blender and cook, stirring frequently, for 3 minutes. Meanwhile, since the paste is thick, you will have difficulty removing all of it from your blender. So add the tomatoes and juice to the blender and blend until the remaining paste is mixed well with the tomatoes, about 5 seconds. Add the meat to the pot and mix well with the spices. Then add the tomato mixture from your blender, as well as the sugar, and stir to combine. Raise the heat to medium high and bring the curry to a boil, partially covered. Allow it to simmer for 2 to 4 minutes, stirring occasionally until the sauce thickens slightly. Adjust salt to taste. Do not overcook the meat. Remove from heat and stir in the yogurt. Garnish with cilantro if using and serve immediately with rice. When making Indian food, I like to throw in a few cardamom pods with the water that I cook the rice in. I was searching for Yemeni Borma recipe and landed on your page. I am an Indian and it was quite interesting and fun read. Not sure if you are still active on this page, but wanted to leave a comment.